543 Australia Sovereign 1855 Sydney Branch Mint Marsh 360 GVF/EF with a hint of mint brilliance, the first Sydney branch mint Sovereign, rare in all grades and especially so in this high grade, a rare opportunity to add a choice piece to an Australian or a Sovereign collection. Whilst South Australia solved its mid 19th century currency shortage by issuing the Adelaide Pound without London's approval Victoria and New South Wales requested the creation of a branch of the Royal Mint which opened in 1855 using part of Sydney Hospital. 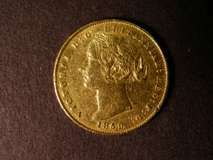 The first coins were struck in that year, including the coin offered here. 657 Australia 19th Century Penny Token Issues (2) Sydney Railway 1855, Hanks and Lloyd Australian Tea Mart KM#Tn83 1 mm between LL of Lloyd with SYDNEY 2.